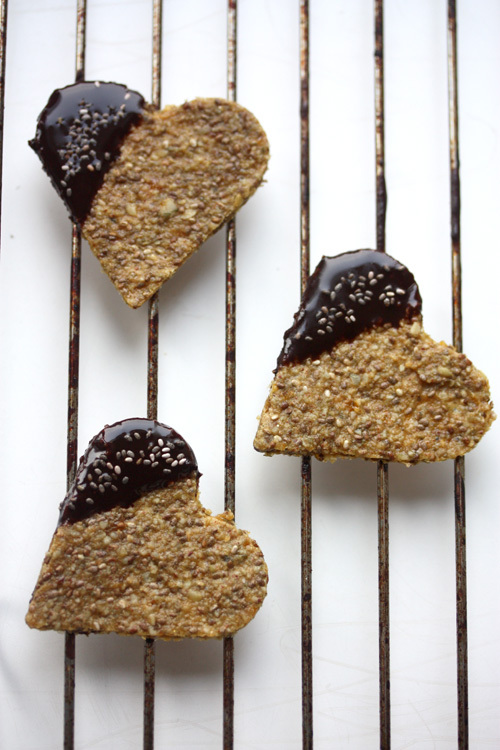 Love Raw: Happy 11-11-11 and Chia heart Cookies! Happy 11-11-11 day to You! Did you know that you can change your DNA by simply exposing your mind to high vibrant words? If you are familiar to the work of Mr. Masaru Emoto, the japanese scientist who photographs ice crystals after the water has been exposed to different words, like "love", "gratitude", "peace" and other high frequency words, forms the most beautiful and well structurued ice crystals. Keeping this in mind, and the fact that our body is up to 70% of water.. You quickly realize how easy it is to put the entire you in a different wavelength, when working with words. This fascinates me, and I'm trying to sneak in good vibe words in my daily life (as well as affirmations). Filling up with not only physical nutrition, but also frequency nutrition is equally as important. • Repeat a sentence with good vibe words to re-progam yourself, like "I am Healthy", "My life is a Miracle", "My Dreams comes True", or what ever you need to fill up with a couple of times every day, you will feel the shift inside. • You can also put a glass of water on top of a note with a high frequent word, and this will load the water with that frequency for you to benefit from while hydrating. I made some chia cookies yesterday, just for the sake of playing around with chia gel, this time in orange juice. They became rather "leather like" in the dehydrator. They certainly must be some sort of "Lambas Raw Cookies". Every bite is maximized with nutrition! Dipped in melted raw chocolate and sprinkled with some extra chia seeds. And the combination of orange, cinnamon and apricot goes so well together! 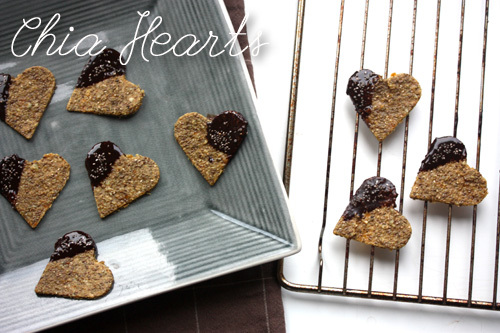 Chia Hearts, makes 10 (nut free). Grind the Pumpkin seeds into a flour. Add the Chia to the Orange juice and stir, let it soak for about 10 minutes. Now add the Pumpkinseed flour and Chia gel with the rest of the ingredients to the food processor and process until you have a rather loose dough. 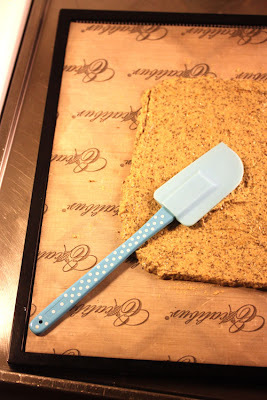 Spread the dough evenly on a teflex sheet using a spatula, put on a mesh tray and let it dry in the dehydrator for 8 hours. Remove the teflex sheet after about 6 hours. You do this by carefully folding the side of the teflex sheet underneath the dough, and slowly pull it to expose. Or, put another tray on top and flip! When the dough has become "leather like", use a heart shaped cookie cutter and start stamping the dough! Melt the Coconut oil in a water bath or in the dehydrator. Add the Cacao and Agave, stir by hand. Wait until the chocolate thickens before you dip the hearts. Sprinkle some Chia seeds over the chocolate covered hearts before the chocolate hardens so they stick to the chocolate. Chiahjärtan, blir ca 10 st. Nötfria. • 1 dl Apelsinjos + 2 msk Chiafrön = Chiagel. Gör ett mjöl av Pumpakärnorna i en elektrisk kaffekvarn. Förbered Chiagelen genom att blötlägga Chiafröna i Apelsinjosen och låt svälla i ca 10 min. Tillsätt nu Pumpakärnmjölet och Chiagelen med resten av ingredienserna till en matberedare och processa tills du får en rätt lös deg. Bred degen över en vaxat bakplåtspapper (teflex sheet) med hjälp av en slickepott, och lägg upp upp det på torkbrickan som tillhör torkugnen. Låt torka i 8 timmar. Dra av bakplåtspappret efter 6 timmar, genom att försiktigt vika in ena sidan under degen och dra den underifrån. Torka vidare i ett par timmar. Stansa sen ut hjärtan med en kakform. Smält Cocosoljan i ett vattenbad eller i torkugnen. Rör sen i Kakaon och Agaven för hand. Vänta tills chokladen tjocknat endel innan du doppar i hjärtana. Strössla lite chiafrön över chokladen sen innan den har hunnit stelna på hjärtat. I was craving something like this earlier today. Vilket fint recept! Chiafrön är en favorit. Ska testas!